A volunteer fire chief is being lauded for saving a man from a burning car in central Pennsylvania. 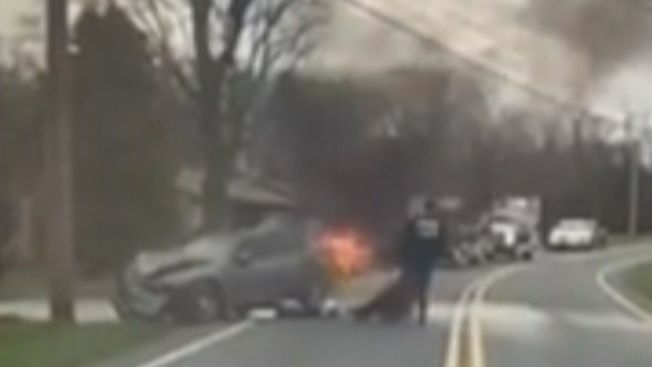 Dashcam video caught Chief Nate Tracey, of Goodwill Fire Company, jump into action when he arrived on a crash in York Township Monday morning. Tracey was the first responder on the scene and soon realized the driver was still inside the burning car. The video shows Tracey reach into the car and drag the driver across the road to safety. There were initially reports that the driver was trapped in the car, but Tracey says the man wasn't entangled in the wreck. He says firefighters extinguished the blaze minutes later. The driver was hospitalized in satisfactory condition as of Monday afternoon.